Doesn’t matter how many safety features and bells and whistles your new vehicle may have – the fact remains: one of the most important parts of your car is the tires. A good set of tires will provide you with optimal control, performance, safety and a smooth ride – but one of the most integral factors of your tires ability to perform is making sure it has the perfect amount of pressure. Not only do properly inflated tires prolong the life of your rubber and provide better performance, but it can also save you money at the pump as well. Make sure you understand the benefits of what to look for when shopping for new tires. 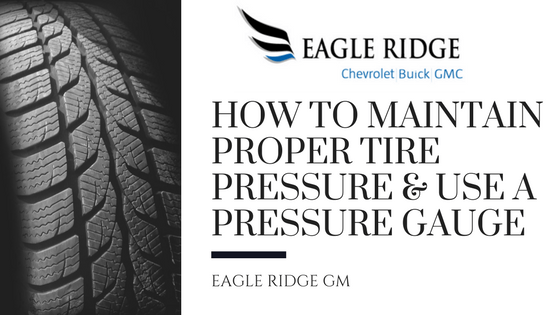 In this post we’ll break down how to properly maintain the correct tire pressure, where to find inflation guidelines on your vehicle, and how to use a tire gauge so you can begin to learn and use these necessary driver-centric skills. Tires that are under-inflated are the most hazardous to you as a driver, and to others on the road. Under-inflation is the number one cause of tire failure on the road and causes the tire to flex more which produces heat – inevitably resulting in a blow out. In fact, one study says that even low-inflation of -8psi can reduce the life of your tires by up to 16% or about 15,000 km. When tires are under inflated, the weight of the vehicle will place pressure on the outer edge of the contact patch, and even onto the sidewalls of the tire. This causes uneven wear that can also contribute to tire failure. Similarly, a set of tires that are consistently kept over-inflated can also contribute to the reduced life of your rubber. Over-inflated tires can also contribute to reduced traction and safety while driving, as the contact patch of rubber that actually touches the road is reduced because of the tubular structure of the tire itself. An over-inflated tire will produce accelerated wear and tear in the centre of the tread pattern as a result. Depending on the make and model of your vehicle, inflation information specific to the weight and purpose of your car can be found on the inside of the driver’s door well. Starting in 2003, this informational sticker provides drivers with the automakers recommended inflation guidelines – including the original equipment tire size and info on the spare tire’s inflation, too. If your vehicle is older than 2003, similar info can probably be found on the fuel filler door, under the hood, or in the glovebox or centre console. Recommended manufacturer inflation info can also be found in the owner’s manual. Similarly, each tire manufacturer also includes the recommended tire inflation measurements printed directly onto the sidewall of their tires. Tire pressure is measured in pressure per square inch (psi). The tire will say something along the lines of ‘Max Load Single’ and will direct you on how much air to put in the tires. Never overinflate on purpose. It’s difficult to accurately measure your tire’s pressure if you can’t properly operate a tire pressure gauge. There are two typical types that you may encounter at the air pump station, or in your local hardware store. A conventional tire pressure gauge is operated by first removing the tire filler cap and compressing the gauge onto the tire stem. As the air rushed out of the tire, it will push a plastic rod out of the opposite end of the gauge itself. Most feature white rods with black lettering that are measured by reading the number that stops at the end of the gauge itself. Alternatively, an electronic pressure gauge is similar except there is no white rod that extends from the end of the tool. An electronic gauge will simply tell you the pressure on a digital screen. In either situation, consult the tire manufacturer’s recommended inflation guidelines to properly inflate your tires; doing so will not only prolong the life of your investment, but will give you added traction, performance and confidence while driving!